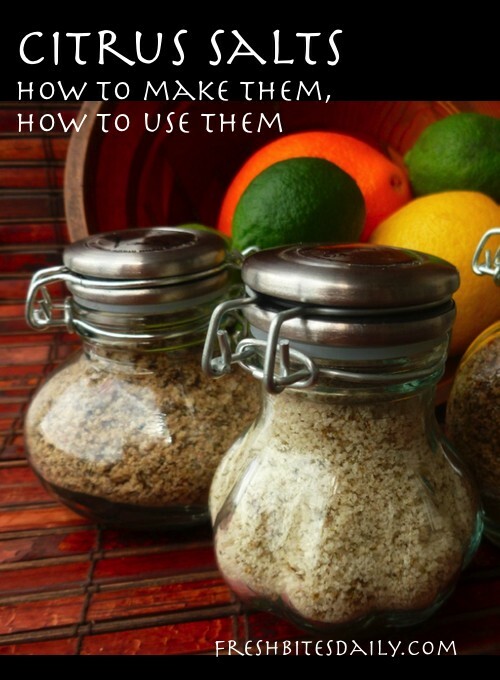 Last year I was inspired by Heidi Swanson’s post to make my own citrus salts. The process is such a no-brainer, drop-dead easy one! Heidi offers suggestions on how to most enjoy these salts as “finishing” salts on things like avocado slices. I was inspired. It took me a whole year to work on the inspiration, though. Hope it doesn’t take you that long. You really don’t want to miss out on all this salty goodness for a full year. Be adventuresome and experiment with different sorts of citrus: lemons, limes, tangerines, and your usual garden variety orange. Whatever variety you use, go for organic to avoid the many chemicals found on most commercial citrus peels. Use a good sea salt, one that you find to be a fine finishing salt just as it stands. Add the citrus zest and you really have a winner. The citrus should be clean and DRY before the zest is removed. If need be, allow the washed citrus is sit out overnight to air dry. Spread it out, not piled in a bowl. 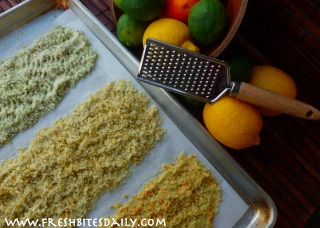 Dry the zested salt until the zest crumbles easily when you rub it between your thumb and index finger. If you still have clumping problems, add a cracker to your storage container to absorb the moisture. Spread it on parchment paper-lined racks of your food dehydrator and set the temp at about 100 degrees. Four or five hours should take care of it. Spread it on a cookie sheet and set the sheet in a pilot-heated oven overnight. Set the cookie sheet in an oven heated to 225 degrees for about an hour and a half. The citrus zest is easy to burn, so keep an eye on your project. Pour the sea salt into a small bowl. Sprinkle on the zest and work it in with the back of a spoon. A mortar and pestle works well is you have one. Spread out the salt on strips of parchment paper to dry in any of the three ways described above. Check for dryness by rubbing some zest between your thumb and index finger. Look for the zest to easily crumble. If it does not, apply a bit more drying time and test again until the zest is completely dry. Bottle it up in a clean dry jar with a tight-fitting lid. Return the salt to the grinding bowl for a bit more grinding before it is bottled. Run the salt through a small food process to break down the crystal size and to more thoroughly mix in the zest before bottling. 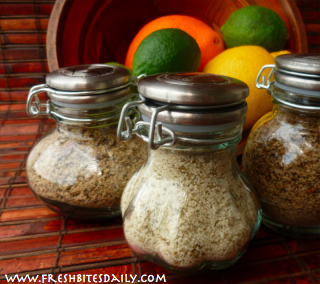 Store your citrus salt in a cool dry place and it should maintain flavor for a couple of months. Store it well, but do not hide it and forget to use this lovely stuff. Sprinkle citrus salts on salads, roasted or steamed veggies, casseroles, bean and rice dishes, popcorn, homemade crackers, fresh tomato slices, and crunchy cucumbers from the garden. I’m sure you have a hundred other suggestions!